The Petzl MYO XP is an evolutionary development of a long line of headlamps from the company that first invented the category and that has stayed well up in the front of the pack as technology has developed. The lamp has something of the older Zoom and MYO family in its DNA but it takes it a step further with a great combination of performance, weight and battery life in a solidly-made package. Good mountaineering headlights have to balance two conflicting demands. On the one had they have to be able to provide a piercing beam of bright light for route-finding, search and rescue and the like. Yet at the same time they also have to provide a lower level of light with a long battery life that is good for everything from cooking and doing camp duties to being able to provide a comfortable light to read by when you are tucked up warmly in your sleeping back. In the old days it was done by using two different bulbs. When LEDs came along many of the early headtorches just followed the same tradition. They had a couple or three LEDs for close-up light and a big bulb for the main beam. Similarly when super-bright LEDs came along they just swapped out the bulb for a big LED. What makes the Petzl MYO XP great is that it uses electronics and a clever filter to provide both tasks using just one bright LED. For serious beam-throwing you crank it up to maximum power and get a beam of light that goes way out. Many people feel as if they have a car’s headlamp on their heads. It even has a boost mode. That’s a bit like the warp drive in the old Star Trek movies – “I’m giving it all I can captain, but I’m not sure the engines will hold”. You can fire up this mode for about 20 seconds and get an extra 50% light output but it can’t sustain this level. Even so, it is a great feature because in tricky situations when you need a beam to pick out a landmark or if you’re trying to find someone at night it could be a real lifesaver. For close-up work you can use dimmer settings that really extend its battery life. It also has a nifty lens that swings into place and works as a light diffuser so that for close up work, reading and cooking you don’t have such a sharp beam but rather have a wider, softer light. 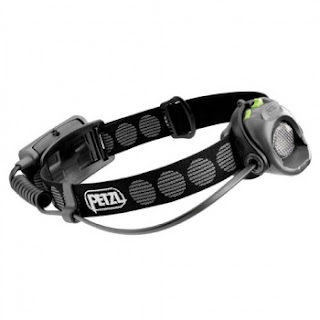 This differs from its little brother, the Petzl Tikka XP, in that it has a battery pack at the back of your head. This adds some weight but gives more battery power so you can get a brighter light and incredible batter life. This baby will run for about 4-5 days on its lower settings. It also has a great little warning system to tell you when the batteries are running flat so you won’t be caught out. There was also a major update on this in 2008 and that made it way better. There were some reliablity problems with the earlier versions but these seem to have been cured with the upgrade. It is also a lot brighter than the older versions. This light has become a firm favorite of trail runners and adventure racers because of its great beam, but it also gives good service in caving, even though it strictly speaking isn’t completely waterproof enough to be used in that role. For really cold expeditions you could consider the belt-mounted version because you can keep the batteries warm. Frankly I never bothered because of the extra bits and bobs and the extra bother. This thing should keep warm enough in its head-mounted version if you have a good had and pull it down over the battery pack. After all, if it gets seriously cold then so is your head. Batteries are also getting better all the time so you could always try lithium ones which handle the cold a bit better. All in all this is a great lamp. I’d still stick with the smaller Petzl Tikka XP for most camping and mountaineering, but if you feel you really need a bit more light, then it is hard to beat the Petzl MYO XP.